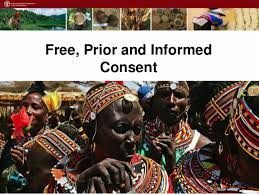 This Free, Prior and Informed Consent (FPIC) Manual is designed as a tool for project practitioners (herein referred as project managers) for a broad range of projects and programmes (hereinafter to be referred to as projects) of any development organization, by providing information about the right to FPIC and how it can be implemented in six steps. FPIC is a principle protected by international human rights standards that state, ‘all peoples have the right to self-determination’ and – linked to the right to self-determination – ‘all peoples have the right to freely pursue their economic, social and cultural development’. Backing FPIC are the United Nations Declaration on the Rights of Indigenous Peoples (UNDRIP), the Convention on Biological Diversity and the International Labour Organization Convention 169, which are the most powerful and comprehensive international instruments that recognize the plights of Indigenous Peoples and defend their rights.